To allow Operate to collect Direct Debit payments from your customers, there are a few things to set up while you create your customer's Account. Please take a look at the general Account setup first, then at the Direct Debit setup below. Please note that we are using the default page layout to point you to fields that need configuring - if you have customized your layouts, their location may be different. Read more about customizing Page Layouts. In order for your bank to process your Direct Debit payments, you will need to provide a Bank Name, Account Number and Sort Code. You will need a Direct Debit Reference Number which your bank is using to identify and process payments related to this customer. Please add this reference number here so Operate can add it to the Direct Debit Form. Your Account record page will display Standard and Rental Payment Types, which you need to set to Direct Debit. These methods will need to be configured first, before they become available here. Please read more here. Here is where you can select the Organization, Location and period for which you would like to collect payments. Tick Include Previously Exported Invoices if you would like to do so -if this option is not enabled, then Operate will only export invoices which have not been previously included within the collection process. Click Export to continue. Please note that in order for Operate to display any transactions on the Direct Debit Collection page, your customers need to have at least one outstanding invoice. If you expect a particular customer to be listed, please check whether their record contains the setup described above and there is an outstanding invoice alrerady generated for the Account. Once your transactions are selected, please click Export. 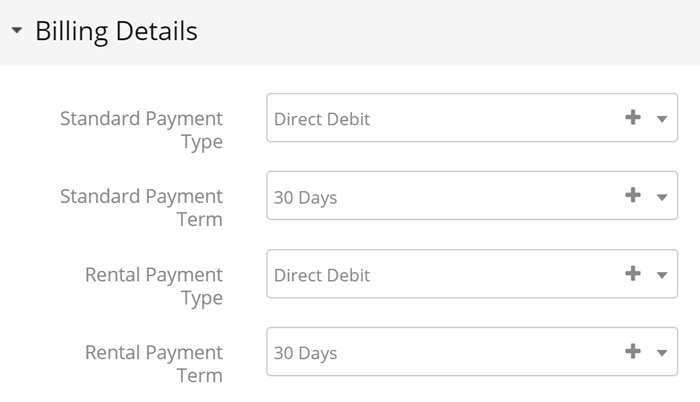 Operate will now ask you whether you would like to mark the invoices as paid; as well as to set the payment date. You can do so unless you want to wait for a confirmation from your Bank, after which you can go to Invoicing > Invoices and edit individual invoices to mark them as paid. Marking them during collection makes the process easier for you and you can subsequently manage any failures on an individual basis. Click Start Export when you are ready. Operate will now generate a .csv file containing your transactions. Click the Download button in case your file download does not start automatically. You can start another export if you like. Once you have your transactions listed, you can print a Direct Debit form (available as a Template within your Operate Settings - Find out more here). The Direct Debit form and transactions file can then be sent to your bank so that the payments can be processed. Customers who have Direct Debit set as a payment method will not have the option to pay for their invoices using your Portal. The direct debit process is used specifically to produce a Bacstel File which is used to upload to the bank or through a third party software for the bank to collect the payments.